Varied Bunting is an oddly-colored species that seems to have about five different shades of blue once we get close enough to see it well in our binocs or scopes. 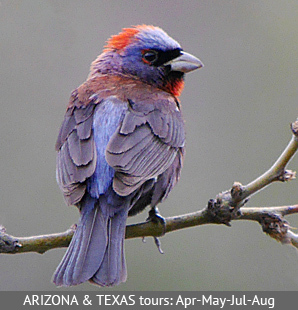 Participants David & Judy Smith photographed this lovely male on one of our May 2018 Arizona tours. This species comes north into our southwestern border areas in spring from wintering areas throughout much of Mexico, adding a splash of color and bright song to what is often a landscape with a much more subdued palette. We see this species and a great variety of other southwestern and west Texas specialties on the numerous Arizona tours we operate from May through August (Arizona: Birding the Border, Arizona Nightbirds & More, Arizona's Second Spring, as well as our long-popular Texas's Big Bend & Hill Country itinerary in April. Check out the tour page for each to see our dates for 2019 tours. You can view our various illustrated triplists at the links below. Each will give you a great taste of what one of these tours is like.